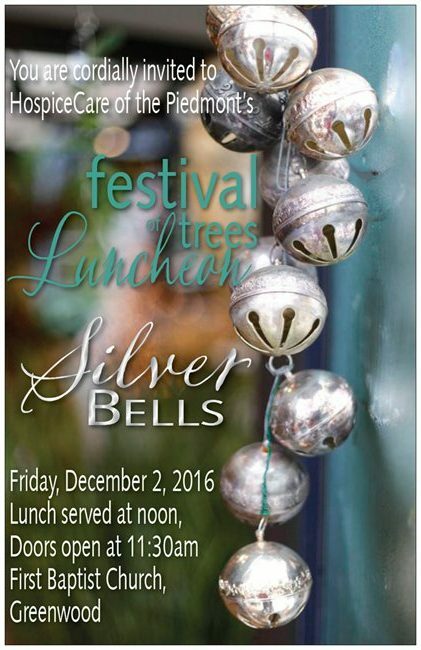 HospiceCare of the Piedmont presents the 25th annual Festival of Trees Luncheon as the premier holiday event in Greenwood. Be the first to Stroll along and enjoy the greenery and lavishly decorated trees and be filled with the holiday spirit! A wonderful holiday lunch will be served at noon. The sounds of Christmas will be there for you to enjoy, as well as the delicious treats and wonderful entertainment. Tickets are $30 and cannot be reserved without payment. Limited seating. 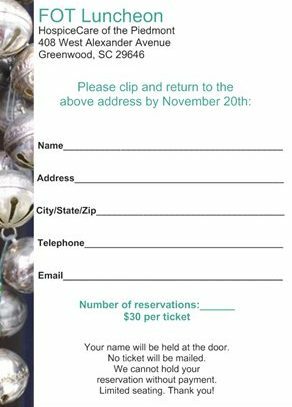 Purchase your tickets by filling out the reservation card and mailing or bringing it by our office. As always, thank you for supporting HospiceCare of the Piedmont!